The Governors have decided that school unifrom should be worn at all times. A list of required items is given to all new members of the School. Failure to wear the correct uniform will result in the use of sanctions. Royal blue blazer with School logo*. Plain grey V-necked jumper with long sleeves and School logo* (no other jumpers, sweatshirts are permissible). 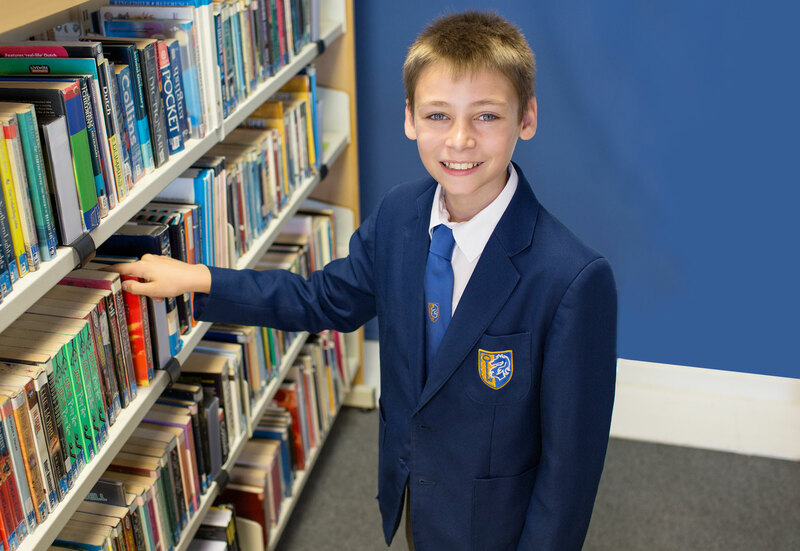 School jumpers are compulsory; to be worn under but not instead of the school blazer. Must be smart, sensible, safe and plain, black. All shoes should be able to be polished. Boots and Uggs are not allowed. Trainer-style shoes or canvas style footwear are not appropriate as formal school footwear. Shoes must be sufficiently robust. All students should have a plain navy or black outer coat (not a fleece, sweatshirt or denim jacket/coat). Hoodies are not permitted in school as either outer coats or as a replacement for the school jumper or blazer. Grey or charcoal grey school trousers (not skinny, corduroy, denim jeans, cotton drill or track suit bottoms). Must be sufficiently tailored to keep the shirt tucked in at the waist. White shirt. Collars must be large enough to button around the neck. The top button must be in place and fastened. Shirts must be sufficiently generous to tuck into trousers fully. Plain dark grey or black socks. Plain black or neutral tights or plain black or white ankle socks. Instead of a skirt, girls may wear charcoal/mid-grey school tailored trousers. Leggings or jeans of any description are not permitted. Girls are permitted to wear discreet make-up. Facial piercing is strictly prohibited, e.g. nose studs, eye brow bars or rings as are visible tattoos. For health and safety reasons the wearing of jewellery is not allowed within school except for a watch and a single discreet stud in each ear. Nail polish is not allowed and nails should be of a reasonable length. Hair should be tied back if long and must be of a natural colour. Shaved heads or patterns are not permitted. Sanctions for those students who fail to abide by the School’s Uniform PolicyWhere a student breaches the school’s uniform policy, this will be seen as defiance of school rules and that student will be subject to school sanctions. Following DfE advice, these sanctions may include exclusion, depending on the circumstances of the case, even if the student does not otherwise display poor behaviour. The kit which is required for PE has been selected for smartness, safety and economy. Although the initial expense is great, experience has shown that most of the kit should last for some years and will all be used in school on a regular basis. PE kit should be clearly named. All PE kit must be clearly named. It is strongly advisable to embroider initials on the front of major items so that their identification is easy. Footwear should be marked both inside and out. MP3 earphones fitted with a mini jack (standard 3.5mm ) Tesco and Sainsbury’s have several types starting from £5.00.